When Rosie and Robert Stewart’s mother died, they had to sort through the contents of her packed house. The last box in the attic, hastily emptied into plastic bags before the house clearance men came, proved to be a treasure trove, and a forgotten history. Hamish Mann had been their great uncle, unknown to them except as a single faded photo from their childhoods. The box was stuffed the brim with papers which contained Hamish’s brief life as an aspiring writer and soldier, before he died in the Battle of Arras in 1917. 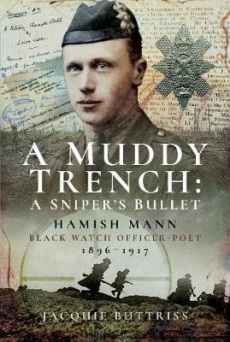 The Stewarts enlisted the help of Steyning author Jacquie Buttriss to bring Hamish’s story to the wider public, and she has painstakingly pieced together his life, and with his own vivid accounts and poignant poems, has created a fascinating insight into life in the trenches and Hamish’s journey from teenage patriotic fervour, to the sadder, more fearful, wiser young man he became in two short years. A timely reminder of the horrors of war.